To facilitate and promote the writing, publishing, and reading of literature in electronic media. Calls – Calls for papers/work. Events – Announcements of events. Reviews – Reviews of e-lit. Press – Mentions of e-lit in the press. 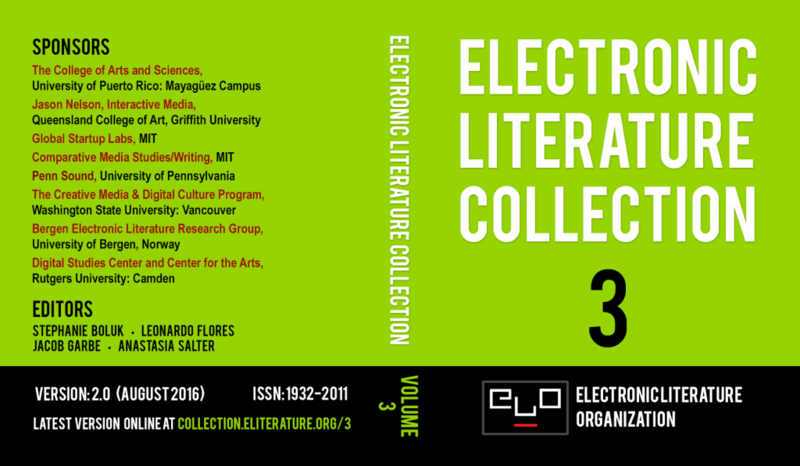 We are pleased to announce the 2.0 version of the Electronic Literature Collection, Volume 3 (ELC3). This version adds preservation and new resources to the 114 featured works. Here are four new features that should be of special interest to our community. The works are now hosted in ELO servers (whenever possible), but we also link directly to their original websites to offer access to their authorial contexts. You can access both, as well as video documentation, through the Begin menu. Downloadable, editable source files and other materials provided by the authors are now included in a new section titled Downloads, beneath the Editorial Statements for each work. You can study these materials from a variety of critical or creative approaches or remix them to create your own. Twitter bots now have archives which allow you to browse, search, and read deeply into their output, from their launch up to January 2016. You can access them through the Begin menu or download them as spreadsheets in the Downloads section. A downloadable version of the ELC3 will soon be available for those who wish to install it in classrooms, labs, or have an offline copy. We are still fundraising to offer a USB version free to ELO members, sponsors, and to distribute to libraries, museums, and archives. If you are interested in contributing to this free and open ELO initiative, contact us at elcvol3@gmail.com.